On Thursday, November 22, in observance of the Thanksgiving holiday, development activities at the Marriott International Headquarters development site will be suspended, and activities may be limited through the holiday weekend. Regular operations will resume Monday, November 26, including equipment and material deliveries, environmental and safety controls, excavation, hauling and drilling operations. We remind residents and businesses in the surrounding areas that there are several other related and unrelated projects underway, with additional road closures likely occurring near the Marriott development site. This includes ongoing work being performed by Washington Gas and their third-party contractors along Wisconsin Avenue. Beginning Monday, November 19, and continuing for approximately one week, Pepco will be relocating nearby above-ground power lines underground. We are aware of an increase in early morning truck staging activity prior to construction hours, particularly along Woodmont Avenue. The developers have taken several steps with the general contractor and subcontractors, along with the Maryland Department of Transportation, to minimize any early-morning noise and other disruptions to nearby residents and businesses. Trucks will begin using the curb lane of Wisconsin Avenue in an effort to alleviate the traffic congestion along the surrounding roads. The developers have also worked with officials to adjust signaling systems to improve efficiency for both vehicular and pedestrian traffic. Please pay close attention to new signage in the coming days. Meanwhile, lane and sidewalk closures remain in place along sections of Woodmont, Norfolk and Wisconsin Avenues (view map of closures here), and we anticipate the closures to remain for an extended period of time through project completion. 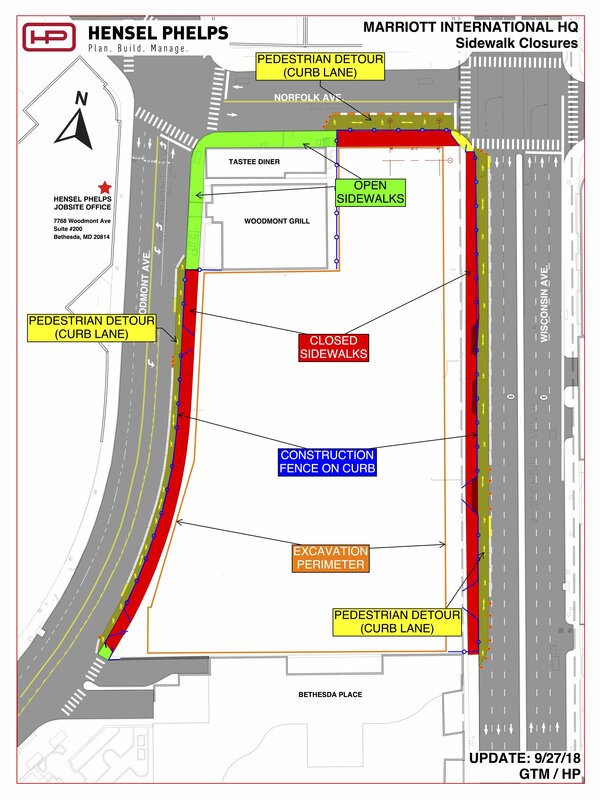 These closures provide access for construction activities, as well as safe pedestrian passage. As a reminder, please pay close attention to signage and flagging operations as conditions may change from time to time. We ask for your patience during periods of inconvenience. Our number one priority is pedestrian safety in and around the project site. Today we are introducing a hotline for nearby residents, businesses, commuters, and other interested parties of the Marriott International headquarters development site. In addition to the information is already available via the MHQBethesda.com website and development update e-blasts, now you can call and leave a voicemail for the development team. 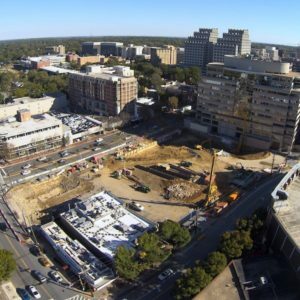 In December, the developers and general contractor will begin providing monthly construction updates in downtown Bethesda. Local residents and business owners are welcome to attend. The first update will take place on Tuesday, December 4 at 6:00 p.m. at the Montgomery County Regional Service Center, located at 4805 Edgemoor Lane, Bethesda, MD 20814.